The pelvis consists of the sacrum, the coccyx,the ischium, the ilium, and the pubis. 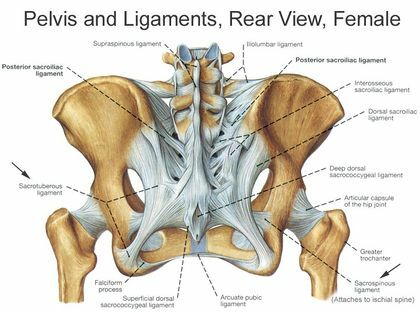 The structure of the pelvis supports the contents of the abdomen while also helping to transfer the weight from the spine to the lower limbs. During gait, the joints within the pelvis work together to decrease the amount of force transferred from the ground and lower extremities to the spine and upper extremities. anteriorly between the pubic bodies (pubic symphysis). There are 36 muscles that attach to the sacrum or innominates. The purpose of these muscles is primarily to provide stability to the joint not to produce movement. The female pelvis consists of a wider sacrum and a wider subpubic angle when compared to males. The female pelvis’ ischial spines are also less prominent than the male’s ischial spines. 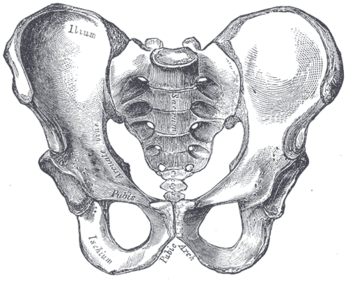 The male pelvis’ sacrum is generally longer and more curved with a narrower sub-pubic arch. In females a wider pelvic aperture is needed as it functions as the birth canal during labour. Prior to the assessment of the sacroiliac joint both the lumbar spine and hip should be assessed and any underlying pathologist should be ruled out. ↑ 1.0 1.1 1.2 White, TD., Black, MT., Folkens, PA. Human osteology. Academic press; 2011. ↑ 2.0 2.1 Lewis CL, Laudicina NM, Khuu A, Loverro KL. 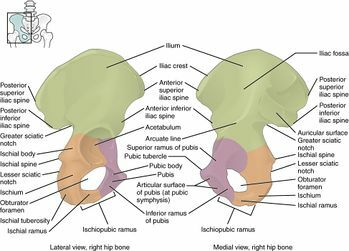 The human pelvis: Variation in structure and function during gait. The Anatomical Record. 2017 Apr;300(4):633-42. ↑ 3.0 3.1 Magee DJ. Orthopedic physical assessment. Elsevier Health Sciences; 2013 Dec 4. ↑ 5.0 5.1 Kurki HK. Pelvic dimorphism in relation to body size and body size dimorphism in humans. Journal of Human Evolution. 2011 Dec 1;61(6):631-43. ↑ 6.0 6.1 Meindl RS, Lovejoy CO, Mensforth RP, Carlos LD. Accuracy and direction of error in the sexing of the skeleton: implications for paleodemography. American Journal of Physical Anthropology. 1985 Sep;68(1):79-85. ↑ 7.0 7.1 Tague RG. Sexual dimorphism in the human bony pelvis, with a consideration of the Neandertal pelvis from Kebara Cave, Israel. American Journal of Physical Anthropology. 1992 May;88(1):1-21. ↑ Abitbol MM. The shapes of the female pelvis. Contributing factors. The Journal of reproductive medicine. 1996 Apr;41(4):242-50. ↑ Lovejoy CO. The natural history of human gait and posture: part 2. Hip and thigh. Gait & posture. 2005 Jan 1;21(1):113-24. ↑ Rosenberg KR. The evolution of modern human childbirth. Am J Phys Anthropol. 1992;35(S15):89–124.